Autism is a growing disorder that affects 1 out of every 100 children. With the growing numbers, school districts may struggle to provide support to all students. Difficulty with social interactions with peers along with challenges of meeting the unique needs of each student can lead parents to consider homeschooling. This is a responsibility that requires planning. Bullying in schools - Children with autism may be susceptible to bullying due to their quirks and odd characteristics. This can have a detrimental effect on your child's self-esteem and affect his academic progress. Divided attention - Children with autism tend to thrive with individual attention, which can be difficult to achieve in larger classrooms. Self stimulatory behaviors - Stereotyped repetitive movements (stims) can be distracting for the rest of the class. There is a lot of sensory input in a classroom. Decorations, noises and even florescent lights can lead to sensory overload. General teaching strategies - There is no single teaching approach that works for all children with autism, but a teacher might use the same methods for the entire class. Difficulty with transitions - The typical school day has many transitions that can be frustrating for a student with autism. Difficulty tolerating change - Students on the autism spectrum may have difficulty tolerating changes in routine. Unexpected events, specials and substitute teachers can be sources of great distress. Any homeschooled child benefits from a customized curriculum that works with individual strengths and weaknesses. For a child with autism, the custom design of a homeschool program can meet developmental needs while incorporating therapy into the learning day. Since you create the schedule, you can cater it to your child. Some children learn better during the day while others may be more alert in the early evening hours. You can focus on helping your child understand every aspect of a subject before moving on to the next. You can schedule doctor's appointments, checkups or therapy services without missing any important lessons. You can create a lesson at the playground, the grocery store, or the waiting room of the doctor's office. You can practice math, science or other skills almost anywhere, anytime. You can incorporate sensory integration into your child's schedule to help her calm and organize behavior. You control meals and snacks, which is important if your child has food allergies, or if you are using a gluten and casein-free diet. Your child can continue to receive therapy and other services since he qualifies for these benefits. Your school system is required to provide services as outlined in your child's Individual Education Program (IEP) regardless of whether he is homeschooled or not. You will need to seek out assessments for speech, physical and occupational therapy through the school's special education department to set up services. Learn about the regulations for homeschooling in your state before beginning a homeschooling program. Violating any homeschooling policies can result in legal action against you. Keep a journal of your daily schedule and write down all work you complete each day. A homeschool daily planner is an excellent organizational tool to consider. 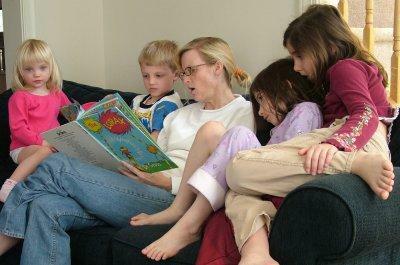 Don't forget about socialization activities in homeschooling. Be sure your child has interaction with people outside of the home and specifically peers his own age. Consider joining a play group or club to help your child have regular contact with children his own age. Stay consistent with your daily routine without being too rigid. Try using a picture schedule to help you child anticipate what to expect. Set aside the same block of time each day for learning, for play and for downtime. Join an online support network to assist you with developing a curriculum, incorporating therapy into the day and troubleshooting any problems you might encounter. Visit LoveToKnow Homeschool for help in choosing a curriculum, developing teaching methods, printing worksheets, and finding basic information. Living with autism can be draining, and taking on the responsibility of homeschooling your child is a big step. The different levels of autism call for different educational settings, each with its benefits and drawbacks. The school district can work with you and your child's treatment team to develop the best learning environment possible, whether it's a specialized school, typical classroom, or home.